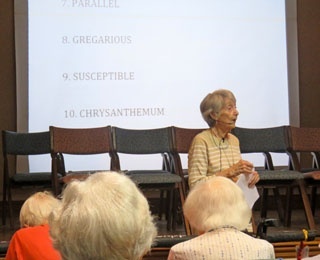 Kendal’s first spelling bee in July was so successful, with gregarious and conscientious participants and fastidious organizers, that it will probably be an annual occurrence. “You said these were going to be easy words,” Ann Francis quipped when ephemeral was read. It turned out not to be intractable for Ann and other residents, who spelled that word and most others correctly. But in keeping with the Kendal philosophy, Kendal Spells! was not a competition. Residents and staff were encouraged to engage in conversation and collaboration and reach consensus with their neighbors. Participants were reminded to “Have Fun! Spelling is good for your health.” Organizers handed out candy bars, whistles and other gift-wrapped prizes to everyone in the auditorium. “We weren’t going to have prizes, but people kept coming up and down the hall asking, ‘Aren’t you going to have prizes?’” laughed Anne Martin, who co-chaired the event with Katie Brown. The idea to hold a spelling bee on campus grew out of Kendal’s success and enjoyment at Spellebrate Lorain County, sponsored by United Way of Greater Lorain County. The Kendal team, comprised of residents Anne, Katie and Ruth Searles and staff member Kim Preston, won last year and placed in the top three out of 23 teams this year. “We found out that many of the other groups had been practicing all year,” Katie said. Most of the words in Kendal’s spelling bee were used at the county event. Kendal’s bee had two parts – written and oral. About 50 people attended, and almost everyone participated in the written event, which consisted of writing down 20 words that judges pronounced twice and used in a sentence. For the oral event, about 10 people volunteered to go up on the stage. Most of them worked as a team. The crowd clapped when the participant spelled the word correctly; a blast on a bike horn signaled an incorrect spelling. Words included incognito, archipelago, maladroit, calisthenics, maraschino and pistachio. Also used were anachronism and metamorphosis, the winning words in the Lorain County event. The championship word from the first Scripps National Spelling Bee in 1925 was gladiolus. “Eleven-year-old Frank Neuhauser of Kentucky correctly spelled it to take home the top prize — $500 in gold pieces and a trip to the White House. “When he returned to Louisville, crowds greeted him with a ticker-tape parade and bouquets of aptly chosen gladiolus flowers, according to The Washington Post's obituary of Neuhauser, who died in 2011. Here is a list of all the winning words from the Scripps competition. What Does It Take to Become a Stellar Speller? To become a stellar speller requires lots of practice and sometimes a tutor, plus a love of words and reading, especially dictionaries. But according to Brenda Rapp, a cognitive science professor at Johns Hopkins University and lead author of a study about spelling published in the journal, Brain, it might have something to do with how some people’s brains retrieve words and manage to get them out. Researchers studied 33 people who had trouble spelling after strokes. “More research is needed to zero in on which techniques works best to teach and learn spelling, but studying followed by testing has helped all of Rapp's stroke patients improve. Repetition – ‘lots and lots of repetition’ – is key,” writes Jamie Gumbrecht for CNN. The jury is still out as to whether technology, specifically spell check, is eroding our ability to spell. But thanks to technology, Google Trends was able to compile a U.S. map of the most misspelled words. Kendal Spells! is just one of the many events at Kendal at Oberlin. We just finished “Kendal Collects”, a show that featured artworks collected by our residents. Next year, residents will present “Kendal Connects”, which displays artworks by residents. And the Arboretum Committee is busy working on growing the John Bartram Arboretum on our campus. Even the Silliness Committee has its responsibilities...such as they are. Want to learn more about life at Kendal at Oberlin? Give us a call at 800-548-9469 or 440-775-0094 or contact us online.